George Graham Reviews Coco Mbassi's "Sepia"
World music fusion is taking a lot of interesting forms. Last week, we featured a CD combining Celtic with Latin American and other world music styles. This week, we have a delightfully eclectic release, the debut by an African performer named Coco Mbassi, which bears the title Sepia. Coco Mbassi, who now lives in Paris, comes from Cameroon, the small West African country which has yielded a surprising number of outstanding performers, including Wally Badarou, who also worked in the dance pop world, Richard Bona, who lately has been performing with the Pat Metheny Group, and who released a couple of his own outstanding recordings that range from jazz-rock fusion to acoustic folk; and veteran African artist Henry Dikongue. Ms. Mbassi's own musical background started at an early age when, growing up in Cameroon, she would take part in groups of children singing hit songs a cappella before the film began in the local cinema. By age seven, she entered a music competition i n Younde, the Cameroonian capital and won first prize. In 1983, Ms. Mbassi and her older sister, who had just turned 18, moved to Paris to pursue music and an education, while their parents stayed in Cameroon. By the early 1990s, Ms. Mbassi was performing the lead vocals with an African vocal group called "Les Chrerubins," and had collaborated with other African artists on the Paris scene, including Manu Dibango, Ray Lema, Salif Keita, and Oumou Sangare. She had been touring with her own band for about two years before this CD was issued originally in France in 2001. Now Sepia is out in the US on the San Francisco-based world music label Tinder Records, who have released some fascinating and eclectic recordings over the past few years. Ms. Mbassi is part of the very international music scene based in the French capital, where a great number of other African performers have flourished. And like other of her Cameroonian musical compatriots, she brings a very global, and often decidedly Western approach to her music. Sepia is a fascinating combination of African style a cappella vocals, Brazilian bossa nova, introspective pieces accompanied by a string quartet, and something approaching so-called "smooth jazz." Though she sings in the Duala language, English translations of the lyrics are provided in the CD booklet, and her words are a distinctive combination of Christian faith and feminism, along plain old love songs, and also some expressions of love and respect for family. For a debut release, this CD is very impressive with its first-class musicianship and the often-stunning vocals of Ms. Mbassi, who can create some amazing acapella arrangements by way of overdubbing. Ms. Mbassi, who wrote almost all the songs on the CD, is joined by a fairly regular band including bassist Serge Ngando-Mpondo, keyboard man Dondieu Divin, and percussionist Salvador Douezy. They are joined by occasional string players, guitarists and backing vocalists. But the arrangements remain quite sparse for the most part, and there is surprisingly little percussion in the arrangements for an African artist. On Sepia, Cameroonian-born, Paris-based vocalist and songwriter Coco Mbassi has created one of the most fascinating and engaging African-based world music CDs of the year so far. Her vocals are instantly memorable, and her artistry is quite remarkable. The arrangements, most written by Ms. Mbassi herself are often quite unexpected, especially for an African artist, with their often contemplative sound and use of a string quartet on two of the tracks, plus diverse influences ranging from bossa nova to classical. Our grade for sound quality is about an A-minus. The music and Ms. Mbassi's voice are generally well recorded, but less dynamic-range-restricting compression in mastering would have resulted in a better listening experience. These days, some of the most engaging and innovative music is coming from a World Music scene in which boundaries are breached with abandon. 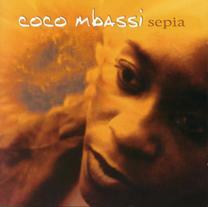 Coco Mbassi's Sepia is sterling example.